DO-90205-24 was succesfully added to your cart. 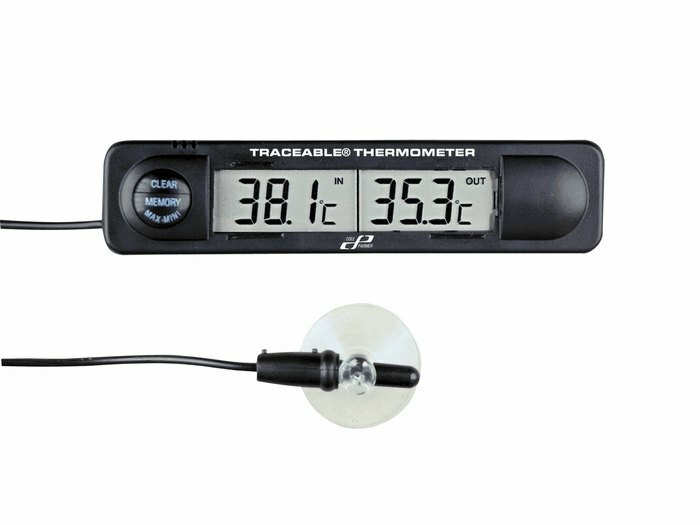 Stick-Style Remote Probe Thermometers have a 3-ft flexible cord, Min/Max memory, and simultaneous display of probe and ambient temperatures. Meter is chemical-resistant and shockproof; comes with a remote sensor and cable that can be submerged. Use as a pocket thermometer or mount for continuous use with the supplied self-adhesive Velcro tabs. How water resistant is the unit? This unit 90205-24 is not waterproof. It is shock-proof and has a chemically-resistant ABS plastic case. This thermometer has a submersible sensor and 3 feet cable. If you are looking for a waterproof unit, I recommend 90205-22.
can you periodically calibrate the thermometer if off? This unit is not field calibrateable. The unit comes with a NIST traceable certificate, if the unit starts to drift we suggest purchasing another unit since it is less expensive then sending the unit in for recalibration. Use it to monitor temperature of a boiler cabinet. No maintenance, simple set up and controls...... and it comes with calibration papers.